We found “something special” near the beginning of the dive. We dropped in over a sloping sandy bottom at 65 feet (about 20 meters). A reef started nearby, at about 50 feet (about 15 meters). In the other direction the sandy slope stretched away towards deeper water. Luther led off angling down the slope towards deeper water. He soon found what he was seeking: A small rock and coral outcropping, surrounded by sand. 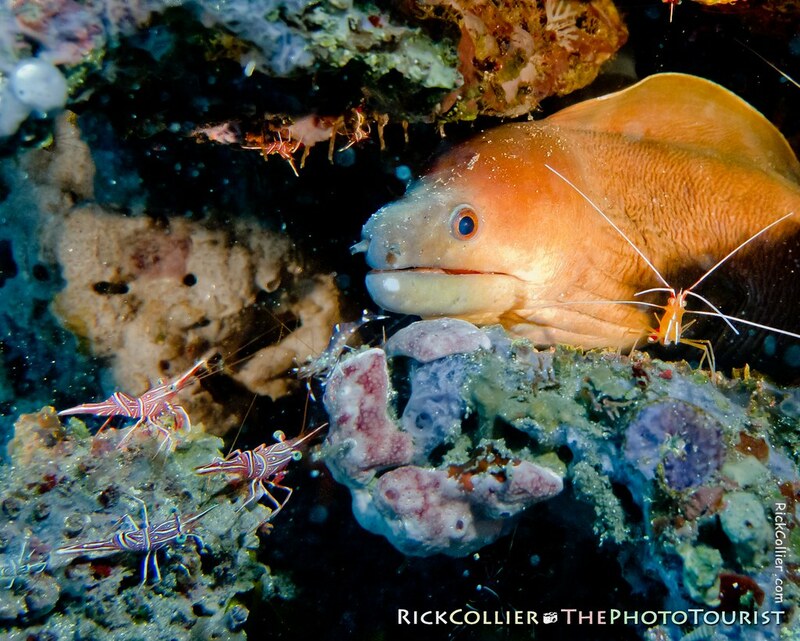 At first I saw a lion fish and an eel that quickly moved into holes under the rock/coral covering. I peered underneath and found the rock crawling with shrimp of all types. Most striking to me were the pink and white striped shrimps. I first mistook them for the peppermint shrimp that I have seen before in saltwater fish tanks, but that was wrong. Where the peppermint shrimp is a streamlined, “ordinary” shrimp shape with pink and white stripes running lengthwise, these shrimp had a distinctly humped back and irregular pattern of stripes. These were so-called candy shrimp (camel shrimp). Whatever their name, they were beautiful and everywhere. Scattered amongst the candy shrimp were various kinds of cleaner shrimp, including banded reef shrimp, scarlet-striped cleaning shrimp, and spotted shrimp of several types. I got down near the sandy bottom to approach closely, then looked up into a crevice in the rock. Inside, a yellow moray eel was watching me. He was half out of his hole and did not seem particularly shy. The many different types of shrimp around seemed to have eyes only for the eel. This entry was posted on Tuesday, March 15th, 2011 at 19:35 PM. It is filed under thePhotoTourist, Underwater and tagged with bottom, Bunaken, Bunaken National Park, Bunaken Park, camel, camel shrimp, candy, candy shrimp, crevice, dancing, dancing shrimp, dive, diving, eel, hole, Indonesia, moray, moray eel, North Sulawesi, rock, sand, scuba, scuba diving, shrimp, Sulawesi, u/w, Underwater. You can follow any responses to this entry through the RSS 2.0 feed.